in recognition of Islamophobia Awareness Month UK in November. The week includes a number of events and awareness-raising throughout the week, so keep a look out. 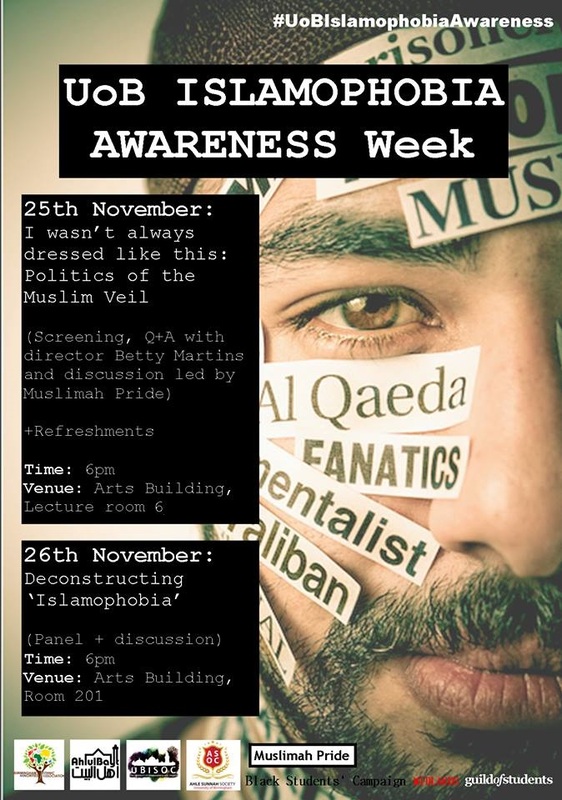 For Twitter users, we’ll be using #UoBIslamophobiaAwareness tag – so join in the discussion there too. Documentary screening of ‘I wasn’t always dressed like this’, following 3 Muslim women on their decision to adopt the Hijab. Panel talk and discussion on Islamophobia, historic and ‘modern’. Will cover topics on the causes of contemporary Islamophobia in Britain, the representation of Muslims/Islam in the media, Islamophobia as a form of racism and more. Stall and leafleting on campus to start conversations and create further awareness about Islamophobia. 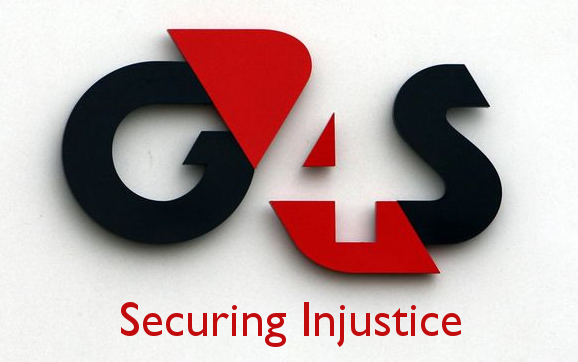 Get G4S out of the University of Birmingham! Statement supported by BEMA against private security company G4S operating on campus, for their history of human rights abuses. Below is a statement signed by a number of student groups at the University of Birmingham, opposing their contract with G4S and demanding that the University exclude it from all further contract tendering processes, in recognition of its reported complicity in human rights abuses and gravely unethical conduct. here’s how I intend to vote at the first Guild Council of the year, as representative of BEMA. Guild Council is the highest student-run democratic body of the Guild* and decides via motions etc. what campaigns the Guild runs and how it runs to serve in the interests of students. If you have any input or views on the motions i’d be happy to take them into consideration – also if you have views that you want shared at Council I can do that on your behalf. *Non-student staff/management/bodies got final say though. The topic of Blackface and offensive Halloween ‘costumes’ has re-emerged on campus recently and it is sad that, in 2013, we must yet again be reiterating the reasons a Zero Tolerance policy exists in relation to such behaviour. Firstly, the symbol of blackface is in and of itself racist and derogatory, referring directly back to presentations of Black people – in entertainment – as simple and ignorant, during and after slavery. White America’s perceptions of Black people were formed by these racist caricatures, which further subordinated and dehumanised them in society. This modern ‘dressing up’ as an ethnic group member and the darkening of the skin to depict this – as entertainment – trivialises this experience and the continuing experiences of being Black in this society today. If you’re unable to partake in ‘fancy dress’ without plastering your face with black paint or make-up, the chances are it’s not appropriate. Of course, this recent controversy is not just limited to blackface but costume insensitivity extending to stereotypes of other racial and religious groups. These costumes too present a caricatured and unsubtle presentation of ethnic groups, homogenising and diminishing their diversity to a number of flat, exaggerated features paraded for entertainment. The people most subject to the social baggage that comes with these stereotypes, those who are painfully aware of the racialised boundaries of modern society, are therefore unable to dismiss such actions as ‘just a bit of fun’. They can’t just pick up the costume and leave behind the struggle. These negative stereotypes are deeply offensive and in a society which is far from post-racial, if members of a particular oppressed group or community take offence to such actions, that should be the only justification needed for stopping your oppressive behaviour. These disgusting characterisations, like Blackface, of BME people were not simply an act by a few rogue racist individuals, but symptomatic of an entire racist ideology and system which upheld and justified it – a system which still exists today, in different guise. The belief that all this is ‘harmless fun’ or ‘not that serious’ indicates a sense of self-entitlement and privilege that, consciously or unconsciously, leads you to ignore and disregard an issue which affects large portions of a particular ethnic group. Therefore, the dismissal of BME students taking offence towards these depictions as an ‘overreaction’ disregards the feelings of individuals whose lives and existences are shaped, contoured – coloured, even – and restricted by the fact that they belong to a particular ethnic group. Being a member of a dominant racial group in not only a racist, but a white supremacist society, means being afforded the luxury of being oblivious to these racial privileges and injustices. The enforcement of the Zero Tolerance policy hardly limits the abundance of costume options, whereas BME students do not have the same choice in their race or culture; they are defined by it. Skin colour and culture are NOT costumes. Zero Tolerance policy has been enforced to ensure that the struggle need not be played out every time an incident like this emerges, and we will stand by it.